According to the latest reports, it seems that offering Apple Pay is no longer enough, hence, the CEO of the tech giant Apple, Tim Cook, and his company, of course, Apple recently announced its brand new and extraordinary credit card. It seems that offering Apple Pay is no longer enough, hence, the CEO of the tech giant Apple, Tim Cook, and his company, of course, Apple recently announced a credit card conveniently known as the Apple Card. This new creation, of course, Apple Card promises very attractive benefits. The card has no annuity charge and offers an interesting cashback program. The new Apple card is built into the Apple Wallet of the iPhone and obviously works seamlessly with Apple Pay. Despite this, the tech giant Apple did not give up a physical version: the “real” card is made of titanium, has a minimalist visual and user name written in the laser. Information such as numerical sequence and CVV (security code) will not be visible on the physical card, but will be stored on the card and can be consulted in the Apple Wallet. Moreover, the all-new Apple Card request can be made from the iPhone itself. In a matter of minutes, the digital card will already be created, as the tech giant Apple permits to do so. User support will be provided 24 hours a day via Messages. Still, according to the tech giant Apple, the all-new credit card of the tech giant Apple was created so that customers can “lead a healthier financial life that begins with a better understanding of their expenses”. Moreover, the Apple Wallet will display details of each transaction, such as store addresses and purchase dates, using machine learning and services like Apple Maps to correctly sort information. Each purchase will be automatically organized into categories like food and beverages, shopping, entertainment, among others. While the Apple Card users will also have weekly and monthly reports to keep track of their spendings as well. While the all-new Apple Card becomes more interesting, simply due to the financial benefits, which starts with the Daily Cash cashback program. The user will receive cashback of 2% of each transaction with the Apple Card made from Apple Pay. For purchases at Apple services, the cashback will become 3%. In transactions made with the physical card, the return is 1% and the amounts are credited daily. However, there is no annual fee, fees for international transactions or limit overflow. If you realize that you can not pay an invoice in full, you can pay the payment at low-interest rates, and not only that even there will be no fine in case of delay. Moreover, the Apple Card comes with Mastercard emblem, has global acceptance and is managed by Goldman Sachs. The financial group, like Apple itself, says it will not use customer data for advertising purposes. The transactions will be validated via Face ID or Touch ID, with the analysis being done on the user’s device. Moreover, the tech giant Apple also says that it will not know what the user bought. For now, the novelty will be released initially in the United States in the coming weeks. 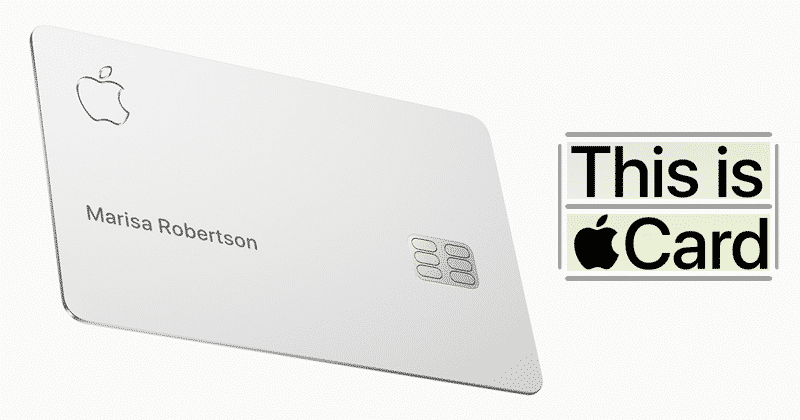 Hence, at the moment, there is no availability of this new Apple Card in other countries. So, what do you think about this? Simply share all your views and thoughts in the comment section below. And if you liked this article then simply do not forget to share this article with your friends and family.